Ivanka Trump traveled to Waukee, Iowa, on Monday to tour a job training and science facility. The trip was to promote the president's infrastructure proposal, which includes funding for federal job training programs. Trump took part in a series of experiments, including testing "vape juice" from an electronic cigarette to measure its nicotine content. The infrastructure proposal faces an uncertain future in Congress. Ivanka Trump participated in some science experiments during a trip to Iowa on Monday as part of a push to raise awareness about President Donald Trump's infrastructure investment plan. The infrastructure spending proposal includes funding to grow federal job training programs like Ivanka's destination: the Waukee Aspiring Professional Experience's (APEX) Innovation & Learning Center. The center is part of a joint job training and research effort between local businesses and the school district in Waukee, Iowa. During the visit, Trump took part in a series of experiments students were conducting. "This is so amazing. This is such a cool place to come," Ivanka said. "It’s going to be hard to get rid of us." 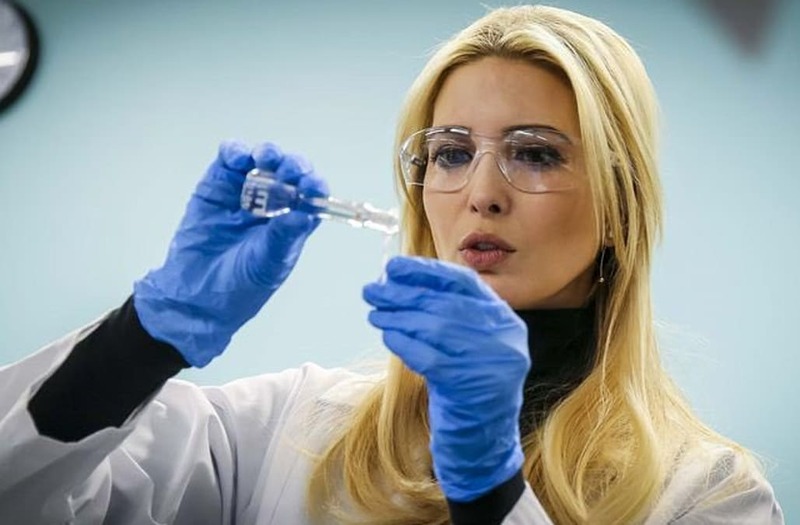 During one of the tests, Ivanka tested the nicotine content of "vape juice" used in electronic cigarettes while donning a lab coat and safety goggles.